Let us exceed your expectations for Cirrus training. At Genesis Flight College, we proudly offer a diverse range of training options to aviation enthusiasts and pilots, from recurrent instruction to advanced instrument procedures training. As part of your Cirrus training, you will train directly with highly knowledgeable, experienced instructors in a one-on-one environment catered to your needs. We also offer options to ensure your proficiency with your new aircraft, so whether you are a seasoned Cirrus pilot or simply getting started, we can meet all your requirements. Cirrus acceptance—If you choose not to accept your airplane in-person or travel directly to the factory, we offer a reliable acceptance service. One of our Genesis Cirrus instructors will sign all necessary paperwork, conduct the inspection, and deliver the aircraft to the place of your choosing. Cirrus accompany—Let us help you get used to your new Cirrus aircraft while accompanying you on your way home. 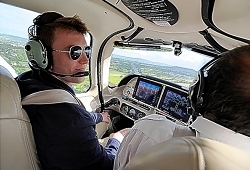 As part of this service, one of our certified flight instructors will fly with you to your home airport, helping you gain confidence with your new plane. Cirrus delivery—Many of our clients combine delivery with our acceptance service. If you choose not to pick up your plane in-person, one of our Cirrus instructors can fly it straight to you. For questions regarding enrollment or any of our Cirrus training options, contact us directly at Genesis Flight College. We look forward to helping you continue your aviation journey! At Genesis Flight College, we can help residents of Toronto, Collingwood, Barrie, Aurora, Brampton, Caledon, Markham, Newmarket, Richmond Hill, and Vaughn, Ontario receive cirrus training.